Educational ERP is the new venture of Cybrosys Technologies initiating a hassle-free management of schools and related management functions. Education ERP encompasses different modules like Student Admission, Student Attendance, Staff payroll, Exam Management, Assignment Management and many more. Each module is comprehensive and effectively manages the embedded tasks within. 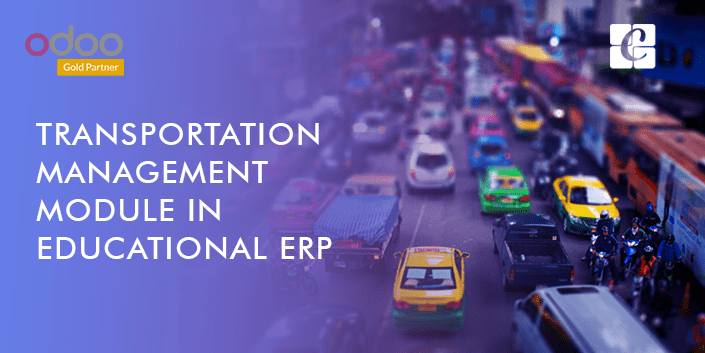 Educational Transport management is a holistic, integrated student transportation management software system. 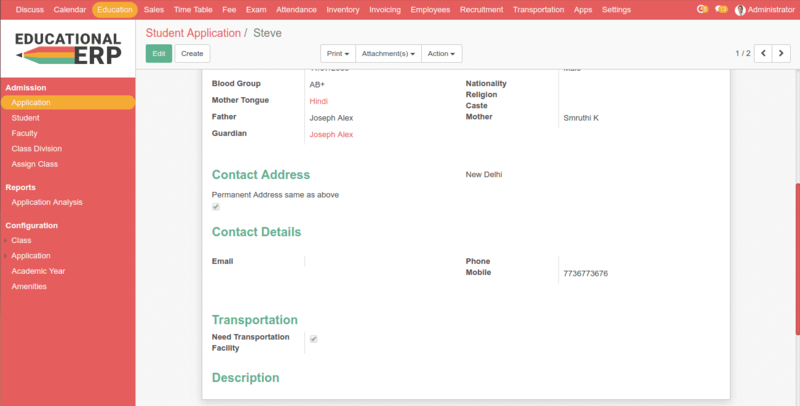 The core functionalities include bus routing, trip management, entity management (students, vehicles etc. ).It is collaborated with a fleet module to manage the vehicles and their maintenance. 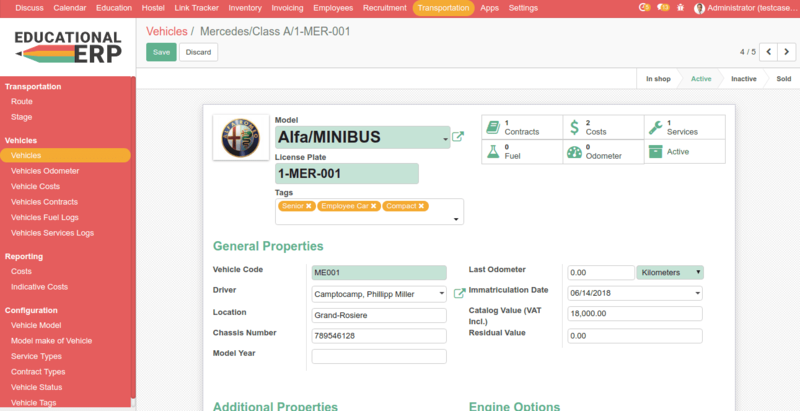 > We can create a contract for vehicles and easily manage each and every operation related to it. First, we need to create vehicles for our school transportation. Add the name, vehicle code, a driver for the vehicle. From the vehicles from the view itself, we can see the related records such as fuel logs, odometer reading, costs, services, contracts etc. Add stages for your routes. Stages should have a correct sequence and add the cost according to the sequence. 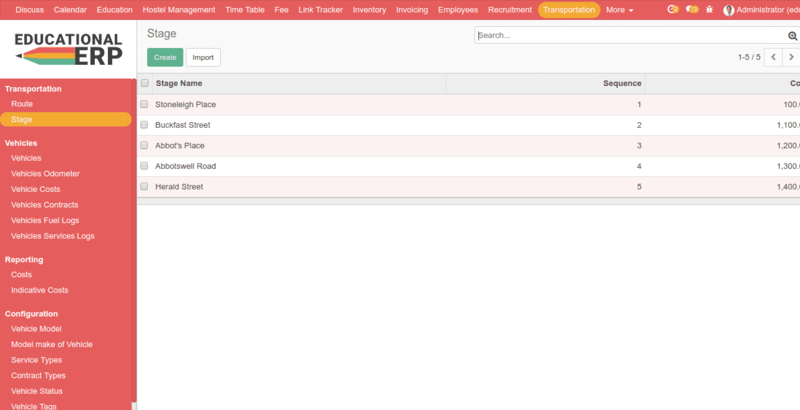 * Under the vehicles details tab adds the vehicle code and driver who have a trip to that root. The transportation workflow starts from the stage of student application.ie in the application form itself we are asking whether there is a need for transportation facility and if it checked when the application converts to admission the student form contains a separate tab to deal the student's transportation details. The above represents the Application form of a student. When the application converts to admission we can provide the transportation facility to a student in his admission form. Give the Route and Stage under the transportation Facility tab. When we go to the corresponding route form, we can see the student is added to that route. One can easily manage the transportation fees when we go to the Fee Section. This is very nice blog posting, thanks for share your information.